← A story you have to watch! 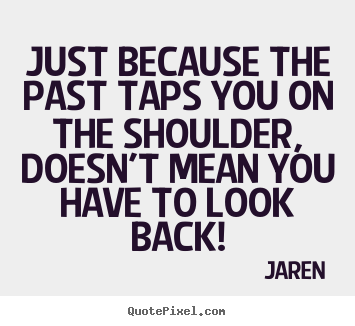 Just because the past taps you on the shoulder, doesn’t mean you have to look back! In the recent days I have been fortunate to visit with a few young people who shared with me some of their feelings as we approach the New Year. A common theme arose in each conversation which is what I want to address in this post. Without exception, these wonderfully successful individuals shared feelings of regret for not having done something they had wanted to do and/or for having done something they wished they hadn’t. I think it is common for us reflect back on our lives in this manner, particularly as we welcome a new year. Our minds naturally reflect on our previous year (life events) and the things we have done as we dream of things we can do. In this reflection many of us are reminded of our difficulties. This is normal, yet often we let ourselves overshadow the good we accomplished or the growth and significant change we truly realized by concentrating on the negative. With it being common that we recommit to our dreams and aspirations through New Year’s resolutions, let me make a few observations that could help us alter our minds’ eyes ever so slightly towards reaching the seemingly unreachable. On Sunday, I heard a great sermon in church in which the speaker addressed the plight of Lot’s wife as found in the Old Testament. She spoke of the happenings in Sodom and Gomorrah and how the Lord was unhappy with what was going on. A warning was issued to Lot, suggesting that he leave the city with those who would follow because the city was going to be destroyed. Part of the command was that they “Look not behind…” (Genesis 19:17) as they escaped into the mountain. Lot didn’t find immediate acceptance to his pleads, yet after some negotiation he and his family left—just in time. Unfortunately, Lot’s wife for unknown reasons turned, looking back to the city and violating the request, which resulted in her being turned to a pillar of salt (verse 26). The woman who addressed us didn’t believe this happened simply because she was looking back, but that she was turned to salt because her heart remained in her previous life. Others have said we can’t occupy two places at once; our past can outweigh our confidence in the future if we let it. Fortunately, my response to the individuals I was visiting with was, “Our past is something to be learned from, not relived.” The past gives us invaluable experience if used right. Bring forward the best of what we have learned then use hope (faith) for where we are going in the future. Christopher Robin famously said, “Promise me that you will always remember you are braver than you believe, stronger than you seem, and smarter than you think.” He was right! But it requires our full attention to realize what he is suggesting. In nearly anything we do in life, when we are looking back, we can’t see where we are going. Life’s lessons, whether good or bad, are behind us. The good are to be used as stepping stones guiding our path toward greater accomplishments. The bad, when used appropriately, are nothing more than falling while trying something new and realizing we can easily get back up and succeed by not following the exact actions. I know of no one who isn’t a better person through their trials of life who has used them as a spring board toward reaching their dreams. No one has ever reached the stars they hoped to touch by looking back and wishing they had done things differently. This year, as you look forward to a new year with dreams and aspirations, don’t be caught looking back and becoming a pillar of salt, never to reach your destination. Rise with hope knowing life’s trails have built an incredible machine designed to accomplish all the heart desires as it builds on experience and forges through the roads ahead. This entry was posted in From friends, Life and tagged achieving your dreams, new year, new years resolutions, reaching goals. Bookmark the permalink.